A fugitive convict from the Netherlands is taunting Dutch police with provocative pictures and videos from Iran, playing a game of “catch me if you can” on Instagram. “I love my freedom. And the weather,” he has stated. Bellingcat was able to reveal the last known location of the criminal with the help of over 60 Twitter users. Here’s how we did that. The fugitive, 35-year-old Shahin Gheiybe, is on the Dutch “Most Wanted” list. On July 5, 2011, Gheiybe was sentenced for two attempted murders. In the city of ‘s-Hertogenbosch, on July 6, 2009, he tried to kill two individuals by shooting at them. He also robbed them of 175,000 euros. Gheiybe, born in Iran, was sentenced to a term of imprisonment of thirteen years. He managed to escape from prison on October 6, 2011, and has been on the run ever since. The police in the Netherlands have searched for this individual since then. The convict posts on Instagram (there are over 170 photos and videos) about his whereabouts (here is the original link to his private account, and a backup link), mostly in Iran. He has almost never tagged himself with a specific geolocation, just towns and places. Only once, for a street in Teheran, the coordinates were very precise. Gheiybe’s Instagram account was created in July 2015. It became private this month, after he landed on the list of most wanted criminals. His last Instagram post is a clip from Scarface (archived post). Gheiybe’s Instagram account contains provocative material, like personal videos accusing the ruling judge in the Netherlands, claiming “the truth is very different.” He tries to explain to his followers he is a nice guy who made a mistake. A problem with scrutinising any of the Instagram posts is that the convict can deceive the police by using bogus location tags in Instagram, backdating the information, or otherwise hiding his real whereabouts. We looked mostly at clues where the convict is clearly visible and, at the same time, is near a traceable object (Gheiybe near a car, in a club, holding a branded knife). Using that method, we tried to reduce the risk of being deceived ourselves. Another problem centered on the ethics of impacting the investigation. If we can find a last known location — as we ultimately did — any convict undoubtedly becomes aware that they are being zeroed in on. Without crowdsourcing, any fugitive’s last address will be much harder to find. Bellingcat got the help of over 60 people who researched with us via Twitter. That research was conducted mostly on March 18, 2019. The police told the public they didn’t know the location. But the public (via crowdsourcing) ultimately did. This is an example of how transparency works both ways: It can be used by both good and bad people. We decided that we would send the police even the tiniest leads during our investigation. And that we would alert them the moment we would find something actionable, so they had at least a head start. We didn’t want to fiddle with a mobile or tablet, but work on a desktop computer. To do that, we downloaded Desktop for Instagram, a Chrome plug-in. Downloading over 170 Instagram videos and photos manually is time consuming. We used a plug-in for Chrome called Downloader for Instagram. It’s fast, downloads all material in full resolution, and also supports Instagram stories downloads. To find the hidden connection between Instagram users, to find what our target liked, and much more, we used Helper Tools for Instagram, again a plug-in for Chrome. In the picture above, for example, the convict is next to a liquor display — focusing in on specific objects can sometimes lead to finding connections. Or, at the very least, you find something about the target’s likes and lifestyle. Question 1: Whom Did He Meet? Last week, Dutch police asked the Dutch public for help with this case on TV. One question was: Who did the convict interact with? Maybe his interlocutors know his possible bogus identity, like a false passport or a false name. We concentrated on that question first. This picture, uploaded on November 27, 2018, shows our target play-fighting a statue, which perfectly suits our need to have an identifiable object and our target in the same photo. We did reverse image search in Google and Yandex — and, as it is often the case, Yandex was the better choice. This is how we found Kish Island, some 200 kilometers away from Dubai. On the same day, November 27, 2018, we found a video where our target was near a car with a recognizable license plate. The video shows our target getting into a red car and driving away in it. Reverse imaging the license plate didn’t work at first. Sometimes, Google simply doesn’t recognize a blown up detail of a photo. This leads to images of tourists driving the same red Chevrolet Camaro with the same license plate. Eventually, we found the Camaro supplier by clicking on some Instagram posts featuring happy clients. Our convict didn’t steal the car. After he drove the Camaro, people were still renting it, as we found out after checking another series of posts by satisfied renters. So, we assume he had rented the vehicle as well. Kish Rent Car, a local car rental place, can shine a light on the current identity of our target. We have a first possible answer to our initial question: Whom did our target meet? Did our target reply to other instagrammers? To find out, we used this formula in Google. Around August 3, 2018, our target asks knife._.store, the Instagram account of an Iranian knife seller, if he can buy a knife and if it can be sent to him. He was prepared to pay 65,000 Thoman, which is around around $15, for the knife. Later that year, on October 22, 2018, Gheyibe posted a photo of two knives on his own Instagram account. The one to the left (see photo above) is the Phrobis III Buck Gen 4 Fighting Knife M9 Scabbard USGI Military Wire Cutter. This model had gone on sale for a short moment in the autumn of 2018, at the previously mentioned knife store in Iran. We were able to find the Farsi Telegram account and exact address of the dealer, another answer to the question as to whom our target was contacting. A summary of our findings up until finding the specific knife reference on the target’s account was given to the police and later published in a Dutch newspaper, which had asked Bellingcat for assistance. I also presented the preliminary findings at a conference of the VVOJ. Question 2: Where Is He Now? Because things were going smoothly, we tackled the hardest question: Where is the target now? We concentrated on a video from March 9, 2019. In this video, Shahin Gheiybe mocks the police while standing in front of a house. We dissected the 35 seconds of video from March 9, 2019 and exported it into over 1200 separate images, each covering a different part of the area, resulting in just one photo of all of the frames the video. For that, we used a sophisticated program called Agisoft Metashape, and this method (the description is currently only available in German). You see our target more than once because he was moving in the frame. Our target posted the video on March 9, 2019, but he may have filmed it months ago. We needed to find something in the video that helped with chronolocation, i.e., finding out exactly when it was shot. Besides the when, we needed more proof of the where: There is no hint of a location and no geotag in the Instagram post itself. We stared long and hard at the white flowers, but only thanks to botanical experts was our next lead found. The plant is called the Magnolia stellata. It bears large, showy white or pink flowers, most of them in early spring, before its leaves open. These flowers don’t last long. The magnolia from the video probably blossomed at the end of February or in early March, very near to the publication date of the video. It was probably shot in the northern part of Iran, because Magnolia stellata wouldn’t be comfortable with the climate in the south of the country. We believed it to be a wealthy neighbourhood, because of the well-maintained garden and the size of the house. The garbage bin in front of the house is of a color and model that is sold in Iran. And there is a reflection in the window as shown here. There is another house in that reflection. We had to focus on a wealthy area in the north of Iran with at least three houses in the middle of what looks like the woods. 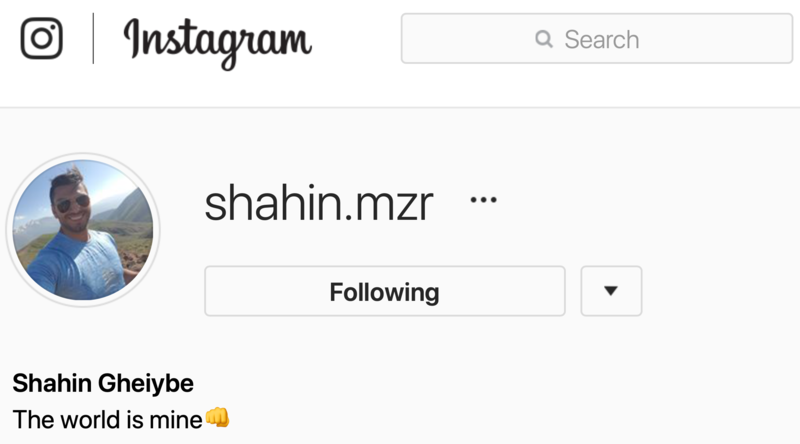 We went back to the Instagram videos of Shahin Gheiybe looking for material that could be from Mazandaran. In one video, published on October 5, 2018, he is driving through the rain. In front of him is a car, to the left of him you can see a sign of some sort of shop (1). The shop is a real estate firm in Abbasabad, Mazandaran. The license plate (2) is also local. It starts with the number 82, which is specific to the area, as Iranian journalist Ershad Alijani from France 24 Observers found out. The architectural style we previously honed in on is present in Abbasabad. At this point, Twitter was going wild. Some Iranians started spontaneously hunting for magnolias and orange garbage cans in the area, by car. The mystery, however, was solved in London. Nathan Lee, a reporter of ITV, recently followed a workshop from Bellingcat with Eliot Higgins and the author of this piece. “The Bellingcat course helped a lot. I did various Google image searches of Abbasabad, Tonekabon, Amirdasht and went on the premise of it being a rich/well to do area of Iran,” he wrote. Just 15 kilometres from Abbasabad, in Amirdasht Town, Nathan spotted the house of the convicted fugitive. If you turn the 360 view around, to the house across the street, there is a clear view of the same orange bin we found earlier. We asked a local Iranian to find out more about the house. It is guarded. The houses in the area are not vacation homes, and the neighbourhood consists of people who own their own places. Once more we went back to older Instagram posting. We wanted to find out if some of the videos were shot inside the house we saw in his Instagram-feed. We found three videos that were probably made in that house because they matched the placement of windows and other details we saw on the exterior. We found similar footage on another Instagram account. That account belongs to a friend of the fugitive. She is a lawyer. The fugitive attended this friend’s wedding, according both to his and her postings. The groom is Shahin Gheiybe’s best friend. The bride claims it’s her house. Therefore, our target most likely lived at a friend’s house. Now that we knew how the inside of the house looked, we could chronolocate this Instagram post, from Christmas 2018, in the same house. Therefore, our target has probably lived for months in that house. Can you trust the statement of a wanted convict? We don’t need to answer that question ourselves. We found the exact spot thanks to open source investigation. But what now? Gathering all of our findings, we went to the Dutch police. They were very happy with the information and used it in their daily briefing, when they decided what to do next. But their hands are tied. While this answer may be underwhelming, our quest demonstrates how social media and crowdsourcing can help pinpoint a criminal’s location. Even if said criminal thought he was playing a clever cat-and-mouse game. Henk van Ess is a member of the Bellingcat team and a Bellingcat workshop trainer. He is an assessor of Poynter's International Fact-Checking Network and is obsessed by finding stories in (big) data. His specializations include social media and data journalism. As an author, he has published books in Dutch, French, German, English and Italian about Google, data journalism, web research, and fantastic Facebook formulas. This text is a very useful manual for anyone, including this particular man, of how to better cover their tracks on the internet in the future (and, presumably, he’s a vain (…), so he’ll be the first beneficiary, once he’s read it. And yes, I’m pretty sure he’s in Iran with no less (and probably more) than tacit approval of the country’s security services. So, the only outcome of this painstaking publicly available investigation is that they will make sure he’s less careless about his digital footprint when they let him out of the country again. Sure, there are tools available to the law enforcement to track him, but why make it easier by publicly pointing out any weaknesses? Unless this text is a honey trap, but then, if he’s in Iran, he’s immune(ish). All that said, he’s just an asset to Iranian services, one of many pawns, and as such, disposable, if and when their “cause” demands it. So there’s a chance he’ll end up in the dock in Holland one day. You would think so, but this person is posting to Instagram as a taunt to the authorities. In doing so he is flaunting a primary rule of not being found – using the same account and posting public images of himself. There are many guides for those wishing to evade being found but in practice we are all quite lazy and put convenience before caution. What makes you think he’s even trying not to be found? He’s in Iran, nobody can touch him except the Iranian authorities. One does not need an extradition agreement. The most probable means for the Dutch police is sending their evidence to the Iranian prosecuting office via Interpol. (Attempted) Murder is a punishable felony in Iran, as is robbery, and Iranian prosecution office most probably is interested in catching a murderer. Been following Bcat since the Russian murder of MH17. Your work is exceptional. Thanks for your efforts. Interesting work you are doing. Hey that was great! I was like “This is some CSI s**t right here, how can I join up!” But it seems like you guys have it covered, Lol, so I’ll just cheer from the bleachers. I wouldn’t worry about that guy being untouchable in Iran, he’s young and seems like a traveller with money so he isn’t going to want to stay in Iran only for the rest of his life. No, he’ll turn up at an airport some day outside of Iran and get arrested and returned to the Netherlands. It’s just a matter of time. Now what would be even more interesting would be to access the IP Camera shown in the Xmas image. It shouldn’t be too hard to at least find devices in that area from IP allocations. Seems a little weird that, just a few months ago, someone would take a 360 degree shot right outside the house where this guy was hiding out. Also, just last month someone took a 360 photo just down the street. These are not otherwise notable destinations. You are only educating him and other criminals “how not to reveal your info on social media” and helping them to be wiser. You are not helping the police and authorities.